In November of 2018, the FDA will start enforcing the Drug Supply Chain & Security Act (DSCSA) regulation that will require all manufacturers and packagers to apply a unique 2-dimentional barcode (the GS1 DataMatrix) on every prescription drug container. That includes all bottle/carton and case lots to be so ld in the United States. Similar regulations taking effect around the world will eventually impact re-packagers, distributors and other supply chain organizations as well. A poorly printed 2D code can cause a disturbance in the supply chain, potentially interrupting supply and hampering business performance. With this concern in mind, suppliers, wholesalers and brand owners are urging manufacturing and packaging organizations to verify their DataMatrix codes to maintain a standardized level of quality and operability. Verification of a linear or 2D code, otherwise known as grading, is different from scanning in that it goes beyond just reading the data held in either code structure to the actual measurement of the quality of the encoded symbol according to the published written quality standard. Verification measures how easily and accurately the code structure employed is likely to scan in a variety of different environments. 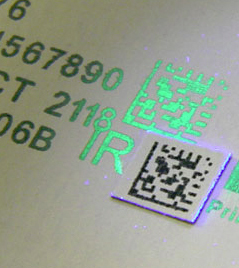 Creating high-quality barcodes is a function of printing and substrates. There are three primary types of systems used to print/mark barcodes and human-readable data: thermal transfer, inkjet and laser ablation/marking. Thermal transfer Overprinting (TTO) applies heat to an ink-laden ribbon, which causes the transfer of the heated wax-based ink onto a substrate and is common for printing on labels while on a web or flexible packaging (films). Thermal transfer systems provide dark, crisp images but do have wear parts and use consumables. Poorly maintained print heads can result in lighter print (lower contrast and/or modulation) or missing elements (failed decode, lower fixed pattern and unused error-correction grades). Inkjet printers are often used for printing directly onto cartons and labels. The nozzles must be kept clean for all inkjet types by using the automatic cleaning functions in small character inkjets systems, also known as Continuous Inkjet (CIJ), the purge and spit functions in Piezo Inkjet technology or the spit function in Thermal Inkjet (TIJ) coders. The carton material should also be unvarnished when employing a water based ink to allow the ink to effectively dry and adhere to the substrate while solvent based inks generally provide good adhesion across the board. When printing directly onto a carton, it is important for the carton conveying/handling system to maintain firm control of the carton. This will minimize potential for skewed positioning and vibration that could cause an imprecisely shaped barcode (affecting grid/axial non-uniformity), wrongly positioned barcode (causing an inadequate quiet zone), or poorly defined elements. At times an off-line transport/printing system may be a good alternative as they eliminate those positioning and vibration issues inherent in an in-line packaging machine. Posted in Carton Coders, Label Coders, Labels & Labeling, Laser Printing, Medical Labeling and tagged Coding Equipment, Medical Labeling.